January 30, 2019 By Gabby BallardIn News & MediaCelebrating National Mentoring Month! The celebration of empowering youth through mentoring continues during National Mentoring Month 2019. Mentor Christa, speaks about her mentoring experience. After many years of donating clothing and supplies to Marygrove, Christa decided to become a mentor in 2018 to Karah, a 9-year-old resident in “Evergreen Cottage”. Although Karah is quick witted, very smart and kind to others, she has a tendency to become extremely reserved when upset or unable to have her way. Christa quickly began her efforts to help Karah identify alternative solutions to work through complicated situations. In their short time together, Christa has already noticed wonderful progression with Karah’s communication skills and the feeling of empowerment she receives when able to make positive decisions for herself. We hope you will consider becoming a mentor to a youth at Marygrove. Click Here for more information or contact Joe Mueller at 314-830-6251 or jmueller@mgstl.org. 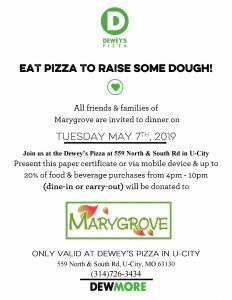 Spirit of St. Louis Ends StrongNoodles & Company hosts Marygrove Fundraiser! !